I have had a bittersweet experience with the device that is the subject of this review. Events over the past few months regarding the future of Nokia have made me all nostalgic. You see the first phone I ever got, back in 2002, was a Nokia, a 3210. As a first year varsity student, I had saved a little bit out of my stipend from my bursary every month until I had enough money to purchase the device, R999. 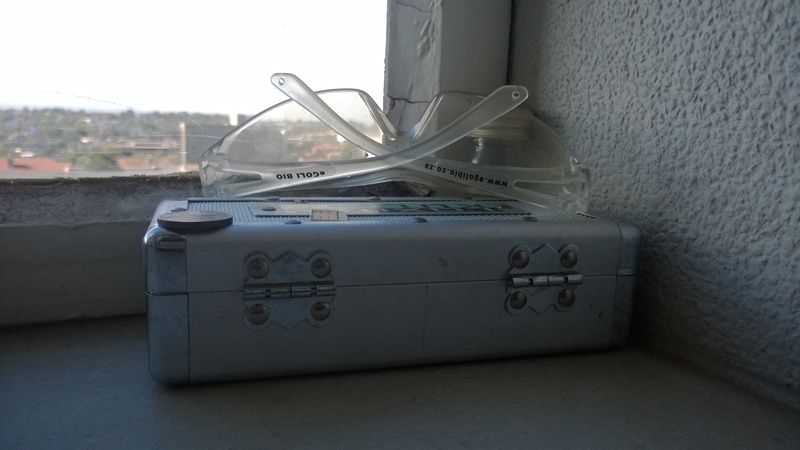 In my only brush with a criminal thus far in my life, I was mugged walking to the main WITS campus the following year, the mugger helping himself to my beloved 3210, but I ended up replacing it with another classic, the 8210. And to this day I would hazard that at least 50% of all phones I have owned have come from the Finnish phone maker, and when you include review devices, my mobile experience is at least 75% Nokia. The impending sale of Nokia’s phone division to Microsoft made me really sad, more so than the demise of Motorola or the obvious decline of Blackberry. I don’t feel this emotional attachment to companies in other sectors. Mobile phones are inherently different to other forms of technology or material objects. It’s not even about mobility because I doubt tablets or laptops garner the same level of affection. 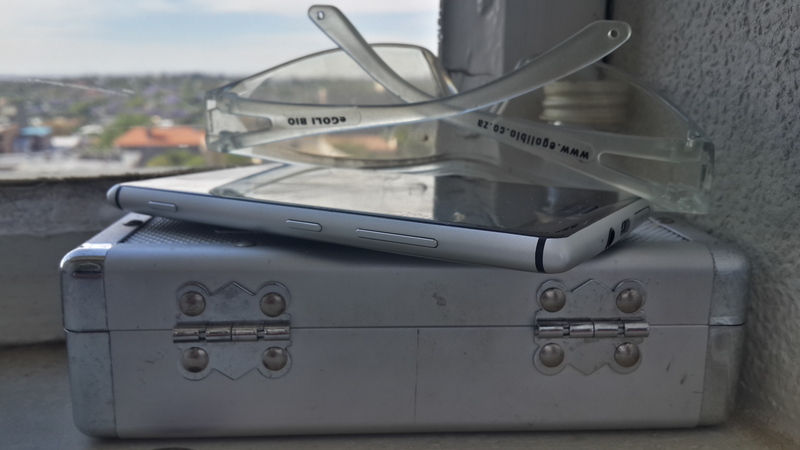 With the exception of a wrist watch, or maybe spectacles for those four eyed amongst us like myself, I can’t think of any object that is as wedded to individuals as is a mobile phone. And of course in the age of smartphones, that permanency of presence is further enhanced (or polluted for some people) by the pervasiveness of services and applications that make up the experience. This makes reviewing a Nokia device for me personally a challenging experience. I often get so annoyed at fan boy wars on the internet over what I often want to believe is merely a tool, a means to an end, but of course when even a small amount of emotion comes into play, objectivity can fall by the wayside. A review of any kind has no quantitative outcome. When I read reviews, I often try to embed myself into the experience that the author is describing. Can I relate to the circumstances? What is his or her use case? Does it mirror mine? It’s not simply a case of drawing up a table, assigning a score (that already lacks objectivity) and calling a winner. The most seemingly arbitrary aspects of a phone can make or break a device. And often what seems like a nailed on success barely piques the interest of the consumer. But before I digress even further, without further ado, let me introduce my subject, the Nokia Lumia 925. When the Lumia 925 was announced, it intrigued me simply by being different. By steering clear of the design language of other Lumias, especially high end devices, it injected some freshness in the line-up. And in the hand it feels even better than it looks. The Lumia 925 is a remarkable blend of quality and comfort that is testament to the quality of designs that emerges out of Espoo. While the back retains the familiar polycarbonate that has graced pretty much all Nokia flagships since the N9, the reintroduction of aluminium is welcome. 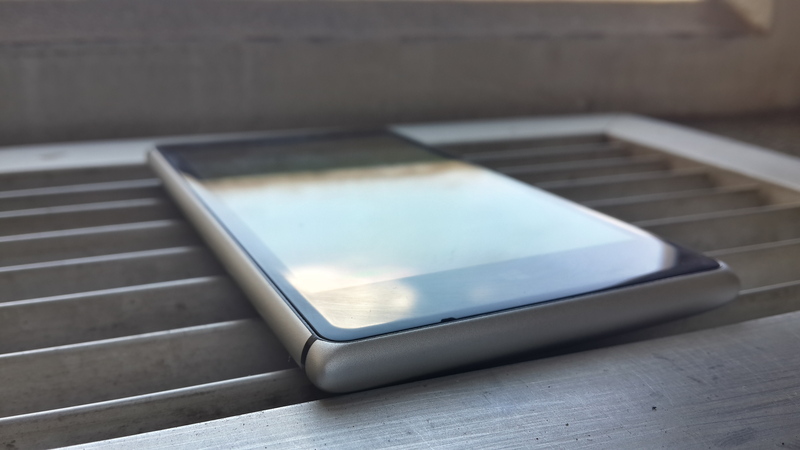 The rim is aluminium, also functioning as the antenna. The cold comfort of metal is something to behold on a phone. The front of the device is dominated by a 4.5” 1280×768 AMOLED panel with the Nokia logo above the screen beneath the earpiece, with the front facing camera to the right of it. The screen is super sensitive like the Lumia 720 and 920. It is vibrant and due to Nokia’s amazing ClearBack technology is stunning even outdoors, and viewing angles are excellent. Below the screen are the standard Windows Phone capacitive buttons. The back of the phone houses the 8.7 megapixel camera module that protrudes slightly unlike other Lumia phones. Camera humps are not to everyone’s liking understandably, but I like to be reminded that there is a decent camera under the hood. While the camera resolution is the same as the Lumia 920, the module itself is modified, the first 6 piece lens element in a mobile phone. That’s fancy speak for improved hardware! 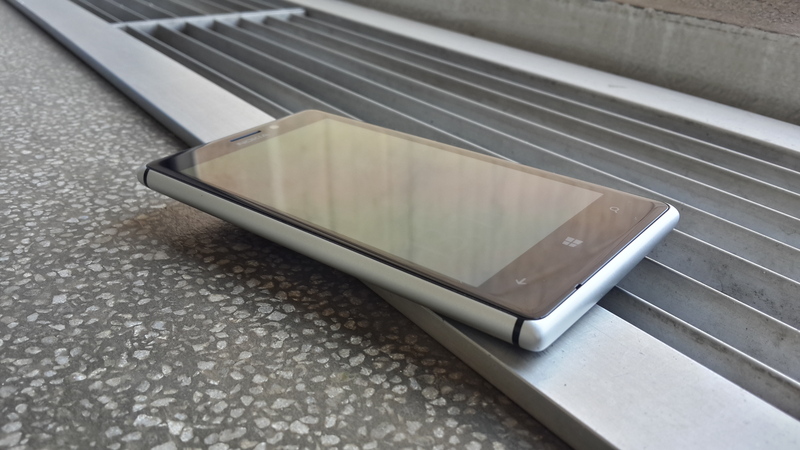 The Lumia 925 is sans wireless charging but three pins above the loudspeaker grill allow for the attachment of a charging back. The end result is a device with lightness that belies the quality in hand. It’s less fat than a Lumia 920 and more understated. It is quite simply the most beautiful Lumia ever convinced and one of the most beautiful Nokia’s too. The internals are standard for a high end Lumia. The device is driven by a 1.5 GHz dual core processor with 1 GB RAM, the usual array of radio and sensors and either 16 GB or 32 GB storage. Alas if you get a 16 GB device like my review unit, just a shade over 11 GB is available and with no microSD slot, careful management of resources is in order. Juice is sourced from a 2000 mAh battery, smaller than that of devices like the Galaxy S4. Specification wise, the Lumia 925 is certainly a contender. Some may prefer the creations out of Cupertino and HTC’s One is also a thing of beauty but in my very subjective (and emotionally driven) opinion, Nokia has delivered the best looking device released in recent memory. 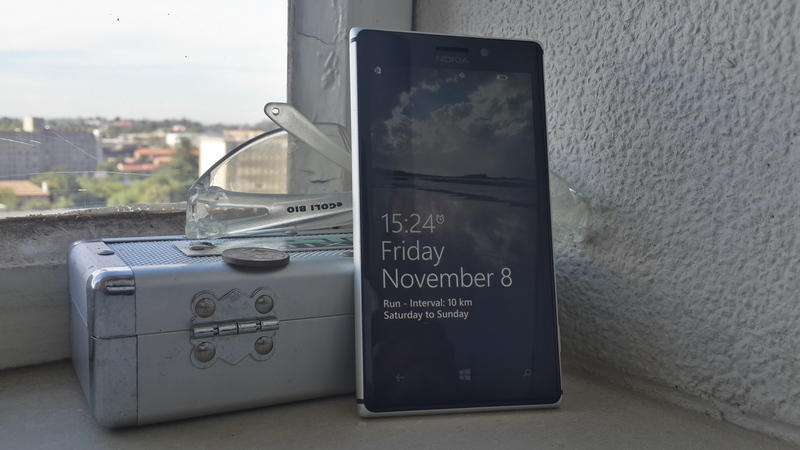 Windows Phone on the Lumia 925 is very similar to the 720 that I reviewed recently. The main difference however is that the software here is the latest available from Microsoft and Nokia, namely GDR2 and Amber, which bring some welcome improvements to the OS and user experience. As heavily embedded as I am in Google’s services, and while understanding that Microsoft (or Google for that matter) is not obligated to provide a 100% Android-like experience for me, I was happy to see that the important core functions for me, mail, calendar and contacts work well. The GDR2 update brings support for CardDav and CalDav, for contacts and calendar syncing respectively, necessary since Google deprecated support for Microsoft’s proprietary ActiveSync protocol. This actually means that those three aspects of Google’s services actually work better than before, especially calendar sync, now with seamless multiple calendar support. Nokia has brought back two features that were enjoyed on older devices. The first is the always on clock on the locked screen. It seems so trivial but it is great to be able to pick up the phone and check the time without fiddling with the unlock mechanism. And now that is the method that debuted on the N9, double tap to unlock. Unfortunately no notifications are shown with glance screen which kind of defeats the purpose to a certain extent, though these will be enabled in the Nokia Black update supposedly. FM Radio support also come to Lumia devices and the best I can say is that it works. Something which is a welcome addition is that the default camera app can be changed. 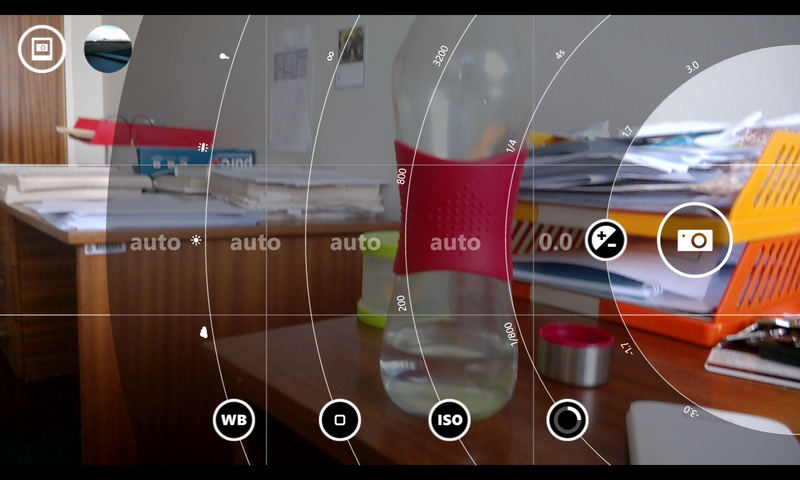 Nokia’s wonderful Pro Camera app is a delight to use especially that it now merges the features of the Smart Camera app as well. 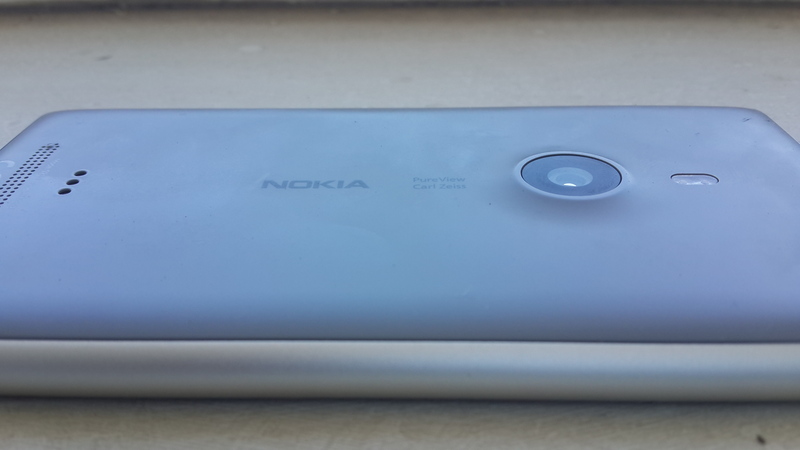 Nokia also promises improved camera software algorithms to complement the improved hardware. And there have apparently been improvements to Internet Explorer too according to the official change log. These software improvements certainly bring Windows Phone 8 closer to the competition. It is still distinctly Windows Phone, which can be a good thing or a bad thing depending on what you’re looking for, familiarity of a new interaction paradigm. Certain aspects of the Windows Phone experience still delight me while others cause me to almost pull my locks out. 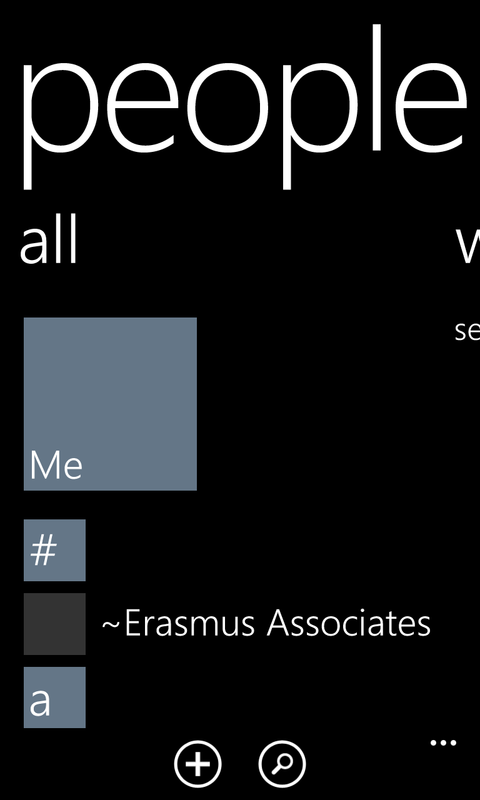 I am still such a of Windows Phone’s sweeping panoramic layout. The use of space can sometimes leave a lot to be desired, but I enjoy not having to tap through many levels within an app. Hubs are an excellent way to organize related aspects, especially with being to link similar apps for example in the music and photo hubs. The best example of this is the camera lenses. On paper this is not much different to Android where from the camera I can share to whatever network or service I want after taking a photo. 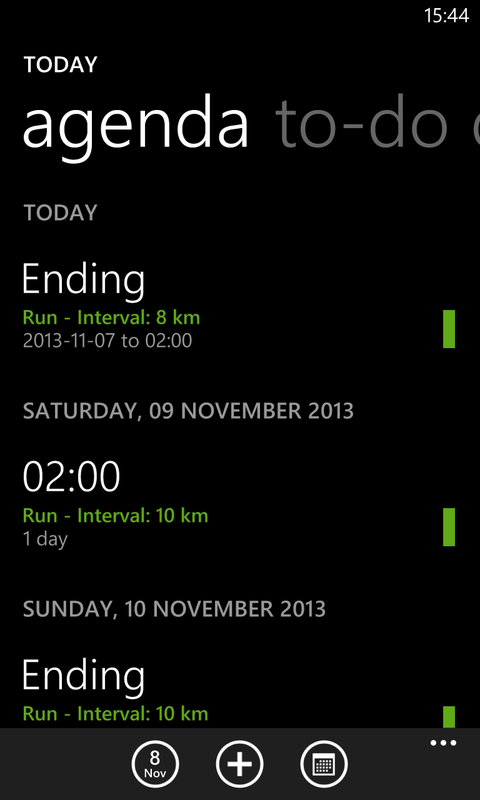 However, implementation is the point here and it is a much more fluid and integrated process on Windows Phone. Well done Microsoft. It’s not all rosy however. 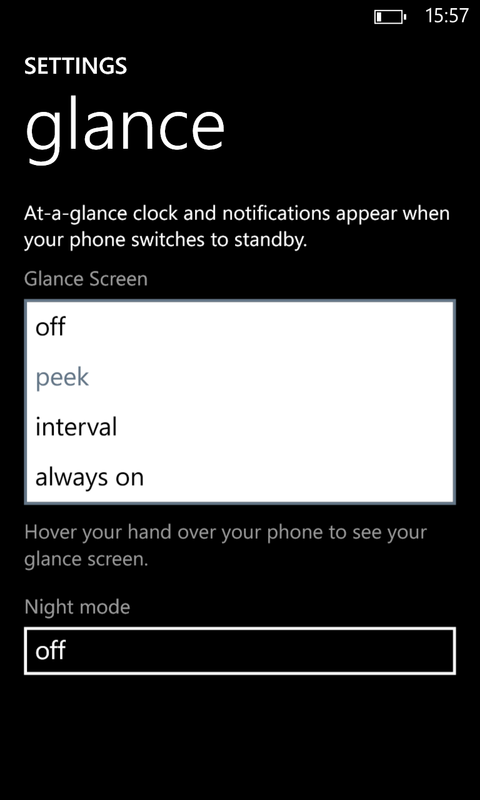 Notifications on Windows Phone are still not up to scratch. The primary means of notifying users is through toast notifications. Toast notifications however do not display long enough to be particularly meaningful. There are two further ways then two view notifications, live tiles and lock screen notifications. The latter is good, with the ability to display notifications for up to six apps on the lock screen. Live tiles are not strictly meant to be notifications but by displaying app relevant information they function as such. Great on paper but there are flaws in the system. The live tiles for the Twitter and Facebook applications for example only ever show ‘1’ once you get a notification. Then the question is ‘1’ what? Is it a mention, retweet, favourite, direct message, like, or a status comment? Who knows! The live tiles also don’t seem to update in real time and to be honest neither do the notifications either. I got the alert for some notifications 12 hours after the fact. Oh thanks for finally notifying me of that Facebook status comment…that I read yesterday. Great! Notifications are such an integral part of the mobile experience and I really hope Microsoft gets it right. This doesn’t mean going the Android/iOS drop down menu way. Meego has the swipe paradigm so Microsoft can have their own. Either way, there needs to be a consolidated space that aggregates notifications for the user. Multitasking or the illusion of multitasking is a lot better on Window Phone circa 2013. App resuming works as expected. Of course you can’t end apps as you wish, in this modern age, we have to trust the OS to intelligently handle that aspect for us. One must still remember to resume apps from the multitasking pane however. Tapping through from a live tile or from the app list will often result in the app launching from scratch. And while app updates from the store will happily continue in the background it still annoys that I have to keep Here Maps foregrounded while downloading map data. Yes this is a once off experience but when you’re downloading hundreds of megabytes of data it’s still annoying! The same is true of Nokia’s video upload app. At least Wi-Fi no longer disconnects when the screen locks. The global volume control situation still seems like such a ridiculous oversight that I struggle to believe it was a design choice. Perhaps it is, I don’t know. I just don’t believe a designer sat down and thought it was a good idea to have one single system wide volume setting. How is it logical that if I turn down my ring volume, my alarm volume must go down to the same level? Or if turn my alarm volume to maximum level, that when I put on earphones to listen to music my eardrums are blown to smithereens? No sane person could have designed that and thought it was appropriate! One very positive statement I can make about Windows Phone in its current incarnation is that the list of positives versus grievances has definitely shifted in favour of the former. It will be interesting to see what level the GDR3 release as well as Nokia’s Lumia Black update brings these devices to. Having looked at an overview of the overall experience of using Windows Phone with the updates to the OS, it’s time to delve into some specific things that are important, (and often overlooked). I’m thinking about the bread and butter tasks, namely messaging and telephony, as well as productivity and entertainment. 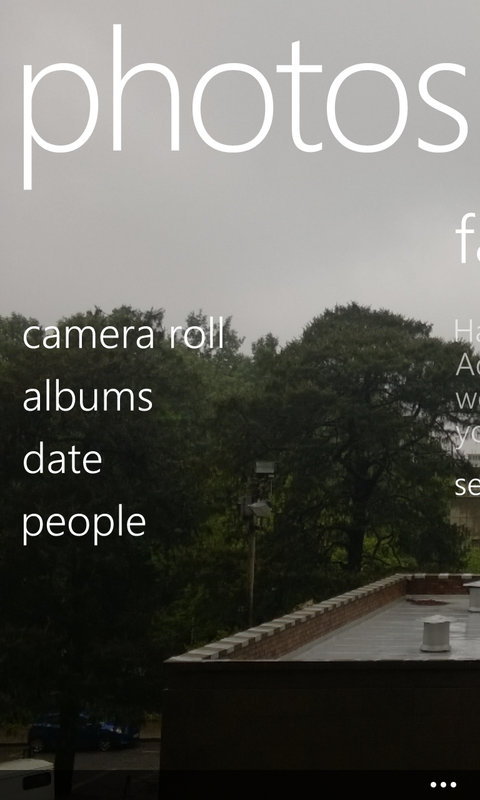 Dealing with contacts on Windows Phone is really pleasant. I like the People hub a lot. This being a modern smartphone contacts can be pulled in from cloud sources, or from somewhere like outlook for the old fashioned types and for the really old fashioned the SIM card. What I really like about the People hub is the contact history, being able to see all your interaction with a single contact, whether calls, emails or texts in one place. Of course the hub also integrates, in a limited capacity, social networks too. I had to switch this off due to a bug that meant the services were consuming massive amounts of data. In any case it ended up being a read-only service for me, and I preferred to just use the standalone apps for Twitter and Facebook (and I’m not a big LinkedIn user). The phone app again is clean and pleasant to use. The default view is the call history with incoming and outgoing call easy to distinguish. There are four icons at the bottom for voice mail, the dialler, contacts (People hub) and call history search. I was a little disappointed that the dialler does not have smart dialling. Though the People hub is just a tap away, I can’t imagine adding smart dialling would be an issue. Call performance was okay. There were no issue with signal but I found the ear piece a bit quieter than I’m used to, it was certainly subjectively quieter than the Lumia 720. The email client on Windows Phone is really good. Yes if you use Gmail it won’t come with all the Gmail features but since Google has made it clear it is not going to be bringing any of its apps to the platform anytime soon, the default app will have to do. And it’s not bad at all. The main view has three main headings, all, unread and urgent messages. Messages are sorted into threads by sender. And you can link multiple accounts into one inbox which can be useful. Microsoft Office is here in all its mobile glory out of the box, as well as note taking support through OneNote. I still think document editing is a bit cumbersome on a phone even on a generous display such as this. It’s still useful to have for quick on-the-fly editing, checking presentations and that sort of thing. Documents can be pulled either from email, SkyDrive or documents stored on device. And of course the device can simply be plugged into a computer and you can drag and drop files. There’s no Google Drive support but there are Dropbox apps in the store. It all works well enough within the expected limitations of a mobile device. The calendar is also decent, displaying multiple calendars and it’s easy enough to filter out which calendars must be displayed. Swiping across the main view, the user is presented with day, agenda and to-do. As this is a windows Phone device, it should come as no surprise that only Outlook.com (Hotmail) to-dos are supported. In this age of convergence, devices are not only jacks of all trades, but they really need to be more than just competent at a task. Something that Nokia has really gotten right with its modern day devices is in encouraging us to leave our standalone navigation devices at home. Android has Google Maps, Apple has their own mapping application and Nokia ships Lumia devices with Here Maps and the Drive app. What sets Here Maps and Drive apart is that it supports true offline mapping and navigation. 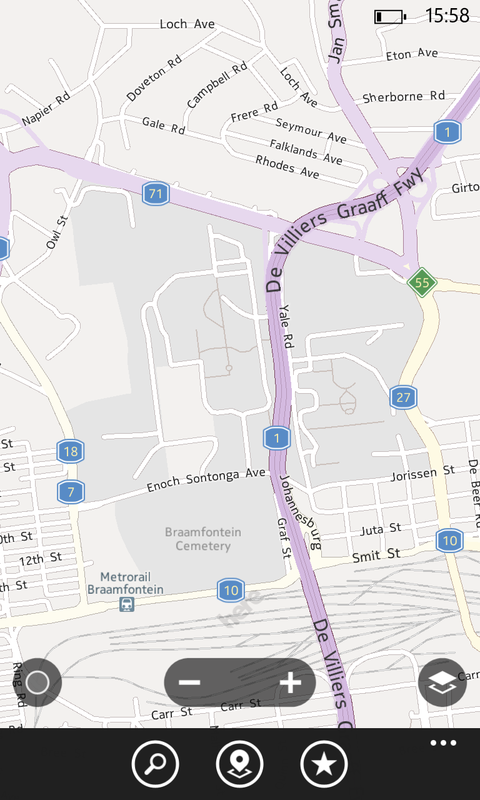 Google Maps does allow for saving a section of the map for offline use. This only works for scanning however and searching the map and navigation still requires a data connection. Once maps are on the device the experience is superlative. The point of interest database is not as extensive as Google Maps but the majority of the time I do find the place that I’m looking for. And of course if there’s no data connection, a slightly inferior database is better than one crippled by being offline. Navigation too is top class. I find the prompts better than what Google’s app offers and definitely more of a par with standalone devices. While Windows Phone ships with a perfectly decent music and video player, Nokia ships all Lumias with their won Nokia Music app. While the app replicates much of the features of the former Nokia Music is an enhancement worthy of inclusion, if only for the fact for users in this country, we are unable to purchase music from Microsoft’s store. Drag and drop makes media transfer a cinch. There is. Windows Phone 8 desktop app but it’s not very good unfortunately. The music and video hub’s main view is the collection, music, videos, podcasts and radio. Swiping to the right reveals in order, the history, new media, and linked apps. Tapping on music brings up the alphabetical artists list. Swipe left and you get albums, songs, playlists and genres. Each listing under each header has a quick play icon to play all items. Once playback is initiated, you are taken to the main play view, a simple screen with from top to bottom, playback controls, artist name, album title, cover art (with a progress indicator and icons next to the artwork for favouriting, shuffle and repeat) and the song name below. It was difficult for me to figure out where the Now Playing list until I accidentally tapped the song title under the album art in the main playing view. It lists three songs the bold one being the current song playing and the next two songs. 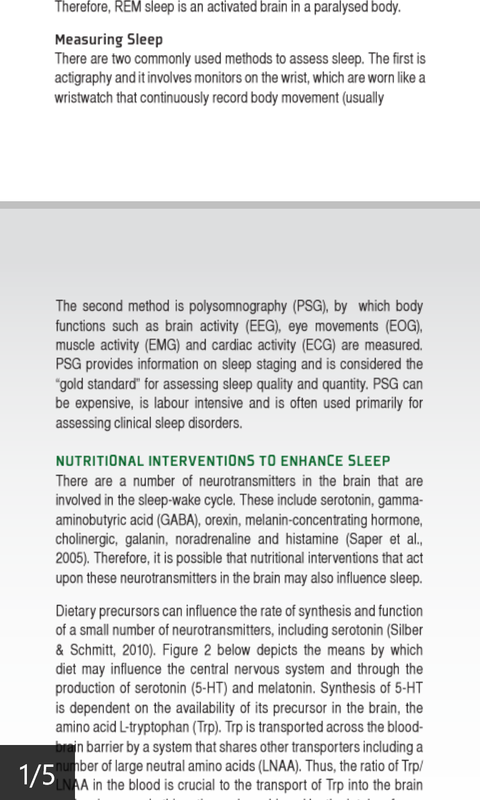 Once you are aware of this it is logical but there was no cue that this would be the case. Other than that gripe it works well. In this view you swipe left or right to change tracks. Going back to your library you can long press a song or an album or an artist to add to the Now Playing list. Curiously though you can’t just start playing an individual song, you always start with an album first and you add to the list. You also can’t manually remove songs or move them around; in fact you can’t edit playlists on the device period. Video playback on this screen is a delight. Tapping through from collection gives you a list of available videos. You just tap the one you want to play and from there it’s much like on any other platform while I didn’t really have any issue with most videos some flash videos that I loaded on the device weren’t listed in the video list. 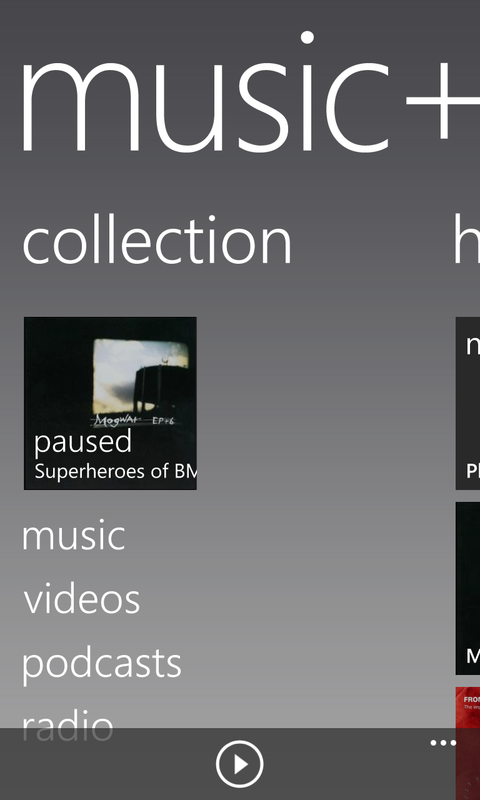 It must also be noted that videos created with the camera don’t show up in the Music and Video hub but rather in the Photos hub. I can’t comment on podcast integration as this is not available in South Africa. There are standalone podcasting in the store. The FM Radio works, just about. There is no automatic way to scan for station, one has to manually search, laborious to say the least. Implementation of radio was far superior even on the much maligned Symbian devices but somehow I doubt this will hardly be a deal breaker. Nokia Music will play back songs saved on the device but not video. The appeal of Nokia music is firstly the store. It’s probably not as extensive as the iTunes store but I have bought a lot of music before and the catalogue is decent with competitive pricing. There is also a gig guide which was actually really accurate. The unique selling point of Nokia Music though is Mix Radio. This is a curated set of genre based stations with some local interest too. They can be streamed or downloaded onto the devices for offline playback. You can also create your own mixes by seeding with your favourite artists. It’s a great way to discover new music and the basic service is free. The service is limited to how many mixes one can download and paid version removes the limitation and offering higher quality streaming. I stuck to the free version. The Photos hub is where user created content end up. If social networks are set up on the device the hub will also pull photos from the networks. Photos are sorted into albums (camera roll, saved pictures, screenshots), by date or user selected favourites. Like with other hubs, other photo handling apps are linked to the hub. Web browsing is a decent experience. Internet Explorer is more than sufficient though I wouldn’t be unfair if I pointed out that sometimes full websites don’t render as expected. There are alternative browsers in the market for compressed browsing, UC Browser and Nokia’s Xpress browser. I use the latter a lot. On other platforms I would typically use Opera Mini, absent on Windows Phone but Xpress browser is a more than adequate replacement. Unfortunately (like say on iOS) any links from other apps will always open in Internet Explorer. More than your eyes can see? The problem for Nokia with any of their camera centric devices is that there is a reputation to uphold as Nokia is without a doubt the market leader in the respect. And moreover when the PureView badge is slapped on the back on the device it raises the stakes even further, what with the outrageous standard set by the first device in the series. Of course Nokia did make it clear after the fact that PureView is an idea not specifically a certain process. Thus PureView simply means addressing a problem not necessarily the workflow. So PureView in the Lumia 920 and 925 does not have to be PureView as we saw in the magical 808 or the iterative 1020. The Lumia 925 certainly does address a problem mobile phones have and it does so well enough. That problem is of course how to gather in enough light to produce usable images when the light levels diminish. The problem for the Lumia 925 though is that the system is somewhat compromised elsewhere. As I said, Nokia has reputation with their camera phones. 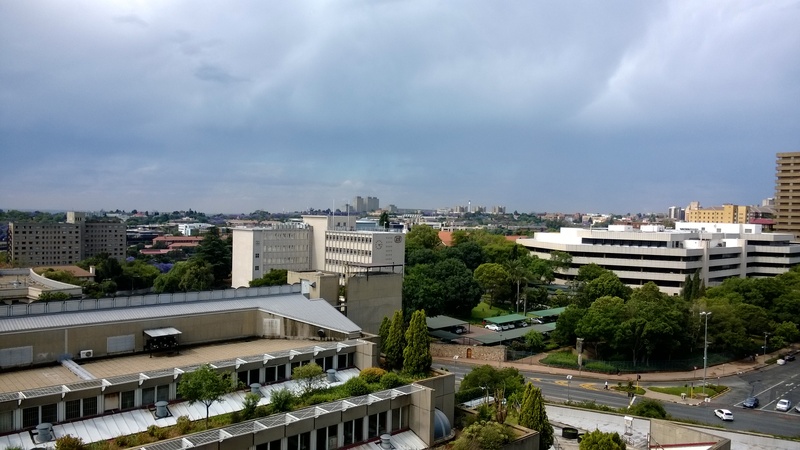 The problem is that having used the mighty N8, outside of two aspects of the photographic process, to my eyes the Lumia 925 is not on the level of the 2010 flagship. Subject illumination in low light is superior with the Lumia 925. And by not running Symbian, the camera software is superior too. 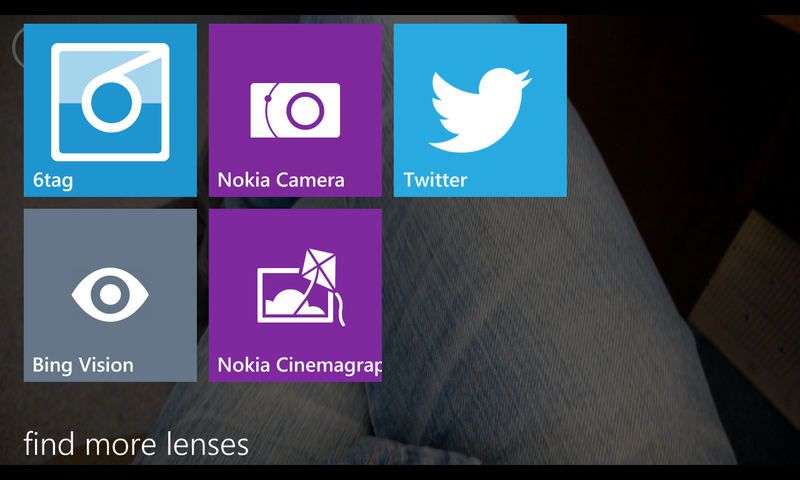 Nokia Camera, the all singing all dancing, camera app on these high end Lumias is a delightful piece of software to use. But that’s where it ends. 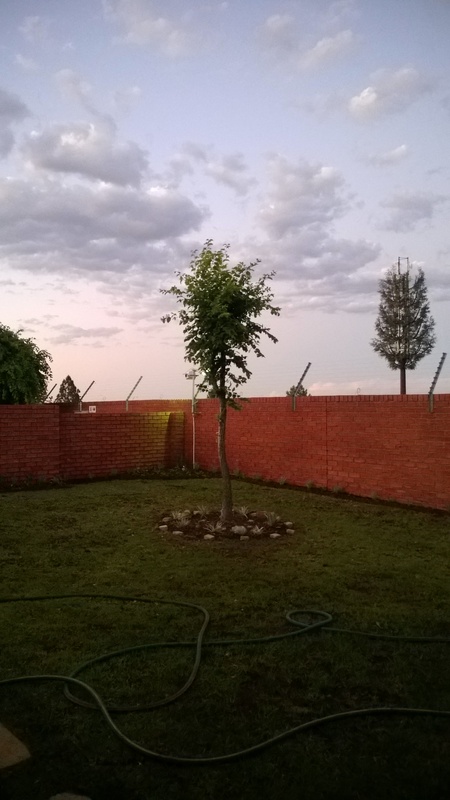 I genuinely believe that with the exception of low light no flash photographs, I took better photos with the N8 that I have managed with the Lumia 925, even though the process of taking photographs is infinitely more pleasurable on the latter. It worries me a little that a 2013 camera phone seems to have taken a step backwards from a 2010 model. And even though the low light photographs are greatly illuminated, almost more than my eyes can see, they are afflicted somewhat by the high levels of digital noise. Having said that the Lumia 925 is still a good camera phone, and I have been trigger happy in my time with it. Photos in good light are very good though no better than my daily driver, the Galaxy S4. In fact, by capturing more detail with to my eyes slightly less processing, the Galaxy S4 actually takes slightly better photos than the Lumia 925. Of course that advantage disappears in low light, where both cameras are hampered by noise but at least the Lumia 925 can illuminate the scene. The take home message here is to somewhat ignore the PureView branding, and enjoy the Lumia 925 for what it is, a good but not excellent 2013 camera phone that will more than often do justice to your photographs. Expect nothing more and demand nothing less and all will be well. You’ll have to excuse my reluctance to subject readers (and myself) to benchmark after benchmark but while they can be revealing what’s far more important is not how fast a device can complete a test but the subjective performance of the device in day to day use. I have already commented on the screen which is fabulous and the call performance which is good. The loudspeaker on the device is decent. It’s an improvement on what was in the Lumia 800 and 900 (and N9) must is not on a pair with that 2010 flagship that I mentioned earlier. But it was more than good enough, the acid test being navigation which it passed even with the car radio on. General feel and speed was very good too. Lag is a word that is thrown around a lot especially with regards to Android and I have to say it is something that I did not really experience on this device. With the Lumia 720 I noted that occasionally text entry was about delayed slightly but the improved hardware here removes that annoyance. I did notice however when watching video and skipping ahead there would be a delay before playback resumed. 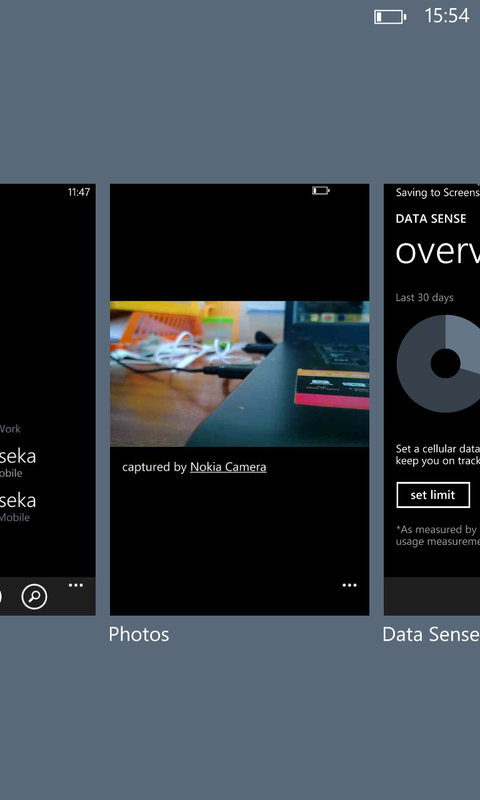 The app resuming screen was displayed for a noticeably shorter time and with less frequency here than on the Lumia 720. Apps open quickly, text entry is smooth, scrolling performance great, swiping, going back through the UI…it really feels like a high end device in usage. Battery life was also good in the sense that you can last through a day. Of course lots of navigation, use of social network apps and the camera will take a toll on the device. My range was from ~12 hours on one particular day of heavy use to up to 40 hours. In general however I would pop the phone on the charger when I got home around 19:00 and take if off the charger when I went to bed. That routine worked well enough for me and I never really gave much thought to the battery otherwise. A discussion of a modern day smartphone is not complete without a peak into the app ecosystem. This is traditionally seen as the weak point of Windows Phone. Like with every other aspects of the Windows Phone experience, the app situation is simply getting better all the time. There are still holes but these are getting filled with the trickle of official support as well as intrepid third party developers. The end result is that the gap, if one does even exist for some people, between Windows Phone toting devices like the Lumia 925 and the competition is narrowing. On the hardware front, taken holistically, these devices are actually on a par, with gorgeous screens, great build quality, equal performance and competitive image and video capture. It then becomes about the little things, totalling up ticks in the pro and con columns and arriving at a personalised preference score. Early on, it was easy to be dismissive of Windows Phone and I certainly was when I had the Lumia 800 for a one month trial, so much so that I couldn’t even recommend it to anyone I knew. Now I’m not so sure. 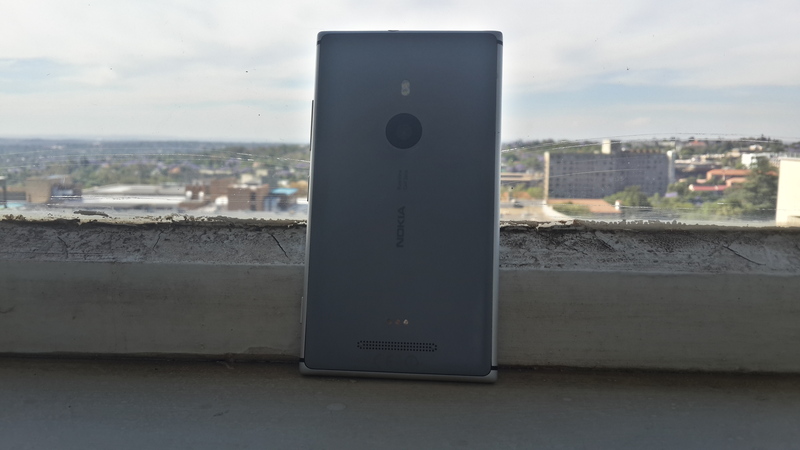 The Lumia 720 certainly won me over, I found the package, the marriage between the software, the hardware and the expectation levels based on the price point, compelling. What about the Lumia 925? It’s a little bit more complicated. The last point in trinity, the expectation level matters more in my view the higher up a device is pitched. While the Lumia 720 feels like a superstar, the Lumia 925 feels like just another one of the gang. That’s not a bad thing, if anything it means that these devices and in particular this platform has come a long way. It does mean however that it doesn’t stand out once the sum of its part is totalled. From my perspective, I don’t see the Lumia 925 as a compelling reason to switch, to echo a campaign that Nokia has been on. Personally I would even lose a little bit of utility if I switched even though I would a little bit too (offline mapping anyone!). Through my time with the device I did adapt to the deficiencies in the platform, they were no longer showstoppers, and embraced the new. 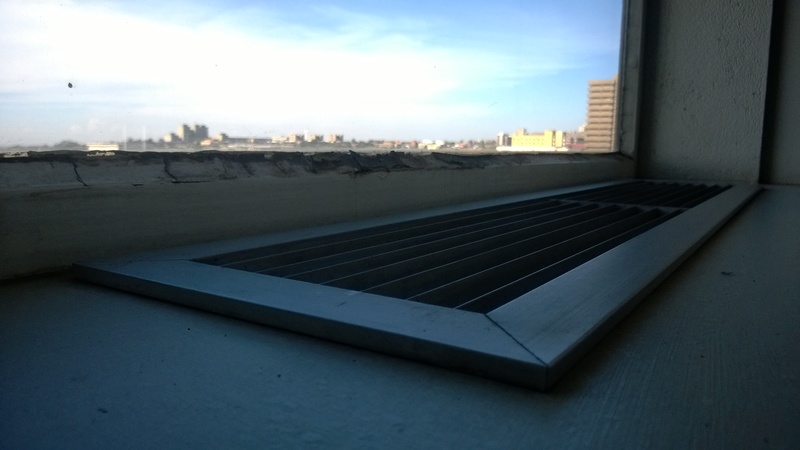 But upon returning to my old workflow, familiarity was comforting. I could switch but do I really have to? For a new user or simply someone looking for a change, then yes, this device with the delightfully designed OS is a contender that must be taken seriously along with the iPhone, the Samsung Galaxy’s and the Android devices it is leading. And that’s as far as I’m willing to go on this one: it’s complicated. ← Nokia Lumia 720: The little phone that could?